I always have felt more American than Honduran, but America finally became “home” when I was granted DACA status. This meant that I could plan for a future here — going to college, settling into a career, starting a family. The trappings of a so-called normal life. I was five years old when I came from Honduras to be reunited with my mom in Houston. I was excited to be in America, back with my family, and in kindergarten. At first, I took Spanish classes alongside English classes, picking up the language along the way. Before I knew it, I had transitioned into all English classes. Things were still a bit tough at home since we shared a small, cramped apartment with my aunt, and my mom was only able to find a minimum wage job. But we pushed through it all knowing it could only get better. My mom was confident that an American education would allow me to achieve my full potential. School became my priority, and I made sure to get the best grades, not only for myself, but for my mom and for our family’s future. The hard work paid off. Last spring, I became the first person in my family to graduate high school, which is only the beginning. Now, I am in my first year studying at the University of Houston, and in four years I know I will be walking across the stage again with the first college degree in my family. I want to set an example for my younger sister, so that she learns that she can do anything she sets her mind to. Throughout high school, I was part of the Future Business Leaders of America club, which led me to join a career preparation program and intern at a Fortune 500 company. Now, I want to help support the immigrant community. I know first-hand that as an immigrant high schooler you feel like you have no options compared to the rest of your friends. It can feel like you are stuck. I hope to mentor kids in high schools to try to get them think about college or any future they see for themselves. 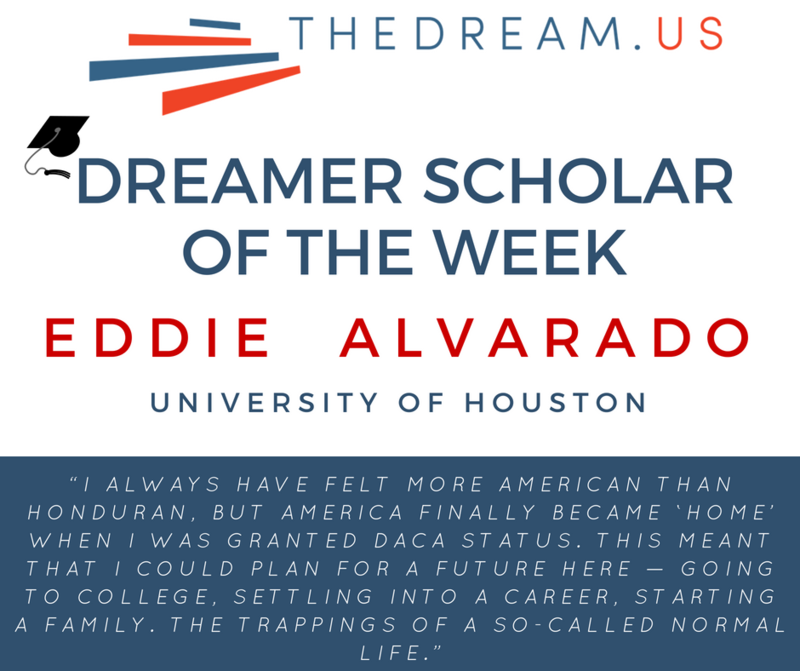 Higher education is important to DREAMers because it allows us to voice our own personal stories and the broader immigrant story to people who might otherwise be ignorant about it. It allows people to see the human side of the tale. The one where immigrants are valued for who they really are and what they really contribute.